Remember, even though education can help improve your life, it doesn’t always guarantee you will be a success. With or without education, you will have to work hard to achieve your dreams. However, one thing is clear: education brings you closer to your dreams. Also, everyone wins when girls go to school. When girls and boys have equal access to education, it changes the world for the better. 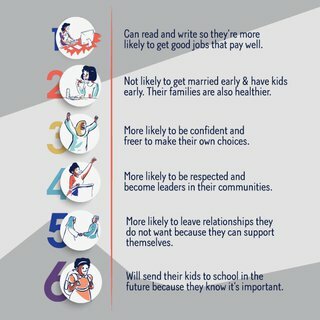 What other benefits do you think being in school brings to girls? Tell us in the comments. Hey Sadik_gg1 Thanks for the comment.